Members of the UK Independence Party protesting against how the tolls imposed by Mersey Tunnels are used across Wirral. Political campaigners gathered to protest at rising tunnel tolls at a bridge over Wallasey tunnel entrance. Watch: Paul Nuttall discusses the day of protest--go to the website to view video. 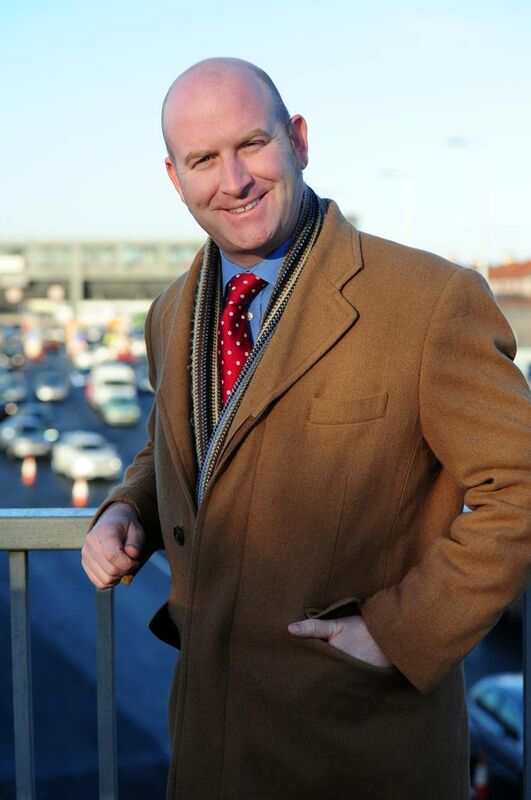 The protest was part of the UK Independence Party national day of action against road tolling across the UK and the deputy leader of UKIP and north west MEP Paul Nuttall was among those at the protest in Wirral. 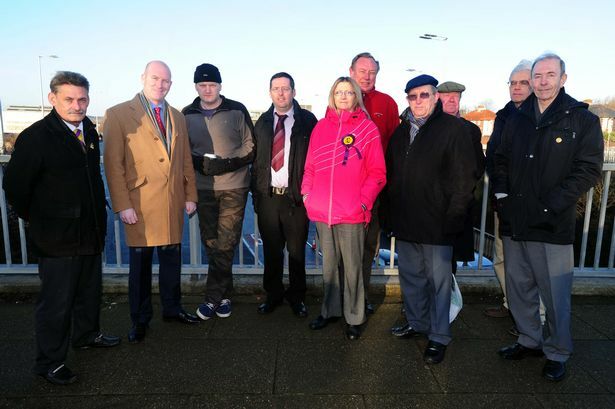 UKIP's Paul Nuttall, second from left, Deputy Leader of the UK Independence Party and Member of the European Parliament for the North West England, joined other members of his party in protesting against how the tolls imposed by Mersey Tunnels are used across Wirral. UKIP activists and campaigners have been occupying strategic locations close to road tolls across the UK and displaying 'Scrap the Tolls' banners and placards to show their support for the removal of tolls. 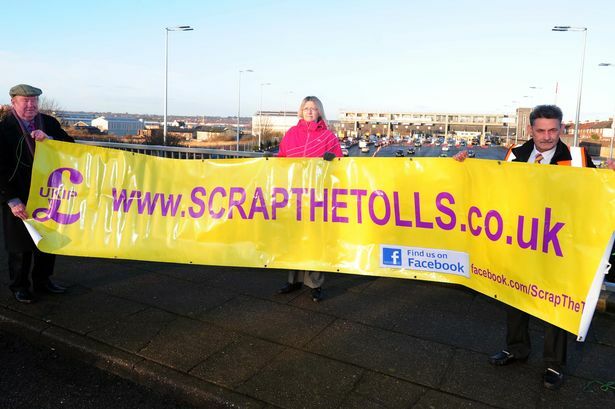 In Wirral UKIP around 10 activists were campaigning at Oakdale Road bridge, Wallasey from 7.30am this morning, holding a large banner calling for the tolls to be scrapped. Earlier this month Merseytravel councillors voted overwhelmingly in favour of a tunnel toll increase, with only four members of the 18-strong passenger transport authority voting against. It means car drivers using the Mersey tunnels will see the toll they pay for each journey rise by 10p, to £1.70, from April 1. It is the second year in a row that tolls have increased for users of the Birkenhead and Wallasey tunnels. The 'Scrap the Tolls' campaign was launched by UKIP leader Nigel Farage in 2002. He said: "Our opposition to road tolling is longstanding, and our campaign gets larger every year. Road tolls are bad for the environment, bad for traffic congestion and bad for motorists’ wallets. "They represent nothing more than a stealth tax on motorists who already pay road tax to use the public road network in the UK."